Read about WestEd's work with schools, districts, and state and federal governments to improve education for all learners. In addition, keep up-to-date with our latest research, resources, projects, professional development opportunities, and more. The system within which a school operates — encompassing both the district and the state education system — can either bolster or stall rapid improvement. To support systemic thinking about school improvement, the Center on School Turnaround at WestEd developed the Four Domains for Rapid School Improvement, a framework designed to assist states, districts, and schools in leading and managing rapid school improvement efforts. As states and local education agencies begin to develop and implement a theory of action that is guided by such a framework, it is important that they also align their spending to support implementation of their improvement efforts. This guide delves into often-overlooked federal funding sources that can be used to support local efforts to pursue rapid turnaround. Although focused on spending at the district and school levels, this resource is appropriate for those involved in school improvement at the state, district, or school level as policies and procedures at all those levels impact how funds are spent at the local level. 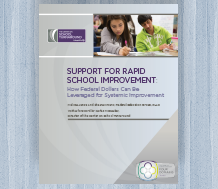 Visit the Support for Rapid School Improvement: How Federal Dollars Can Be Leveraged for Systemic Improvement resource page to learn more and to download your copy.